If ever I needed a reason to buy new boots, Wellies has just given me one with their soon to be released Orange Power Wellies that uses the heat from your feet to charge your cellphone. to create boots that will give your cellphone an hour of charge. All you do? What it is you usually do with shoes – wear them! 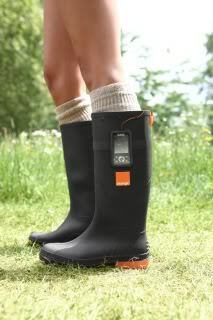 So, tell us – would you buy the Orange Power Wellies? We’d love to know! That’s hilarious! And genius! I have very hot feet, so I may have to check them out, even though I only like to wear Wellies in the rain.